For a value-laden end of summer getaway, Velas Resorts family-friendly properties in Puerto Vallarta, Riviera Maya and Riviera Nayarit are waiving the single supplement fee for single parents traveling with their children. Entertainment for kids ranges from sand castle building, water balloon wars, origami classes and kickball tournaments to foam parties, cooking and baking classes, drive-in movies, eco-cycling tours, and more. In addition to Kids’ Clubs for children ages 4-12 at all the resorts, infants and teens alike also enjoy special services at the Grand Velas Resorts. The dedicated Baby Concierge can help single parents with everything for baby, from cribs, Mexican toys, baby floats, and baby clothes to gentle bath and shampoo gels. High-tech Teen Lounges offer everything from games like billiards, air hockey, foosball and arcade games, to video game systems Xbox and PS3, special seats with built in speakers for enhanced game play and individual cubicles with a 40″ LED TV. At Grand Velas Riviera Nayarit, the Single Parents Getaway also includes one dolphin experience for one adult and two children. At Velas Vallarta, the experience includes an upgrade to a one bedroom suite, early check in or late checkout, complimentary Wi-Fi, City Tour, Cultural Tour, and two days of car rental to explore the destination at leisure. For families that stay a minimum of three nights at Velas Vallarta, an upgrade to one of the resort’s three bedroom suites is based on availability. Through December 19, the Single Parents Package starts at $510 per night for one adult and two kids (4-16 years old) at Grand Velas Riviera Nayarit. Over the same dates, nightly rates start at $400 for adults and $100 for children up to 16 years of age in the same suite at the Grand Velas Riviera Maya. 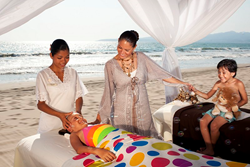 At Velas Vallarta, the package starts at $450 for one parent and up to four children (5 -17 yrs old) through December 22. Velas Resorts all-inclusive rates include luxury suite accommodations, a la carte gourmet meals at a variety of specialty restaurants, premium branded beverages, 24-hour in-suite service, WiFi, fitness center, taxes and gratuities and more. Package components vary based on resort. Blackout dates apply. For more information on Velas Resorts or to book, please call 1-888-407-4869 or visit http://www.velasresorts.com.